The United Kingdom is becoming a country with only one season… WINTER. Reading headlines such as ‘new record for the greatest amount of rainfall in…’ has become a common occurrence and so the people of Great Britain are seeking to reduce the impact they have on the environment. Some individuals are turning to solar panels, which would not only reduce their carbon footprint but also reduce their utility bills and produce renewable energy. In November 2011, Green and Co purchased a number of solar panels which were placed on the roof of our offices. In the past year we have generated enough energy to power an average dishwasher every day for a whole year but are also benefiting financially from the Feed-in Tariff (FIT). The Generation Tariff – You earn a fixed income for every kWh of electricity you generate whether you use it yourself in your property or export it to the grid. The Export Tariff – You earn an additional fixed income for every kWh of electricity you sell back to the grid. The bit you still buy from your electricity supplier – When you can’t generate enough electricity for your needs (if the wind don’t blow and the sun don’t shine) you still buy electricity from your utility company at the normal rates but it’ll be much less electricity than you currently buy. The financial benefits don’t stop there…. Installing solar panels can also reduce your tax liability. Although the FIT is additional income, the government confirmed in 2009 that people who receive income in the form of tariffs will not be subject to income tax. Tax is not due so long as the electricity generated is predominately used for domestic purposes. 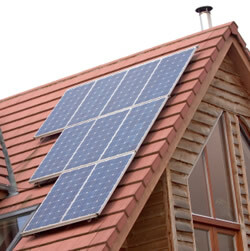 Feed in tariffs are not limited to solar power, so householders who receive tariffs for other renewable energy sources such as wind will also not pay tax on the income. For businesses who install solar panels and receive tariffs they are subject to tax on their income. The rate of tax will depend on what you pay so for business paying small profits rate the 2012 corporation tax rate is 20%. The main rate of corporation tax in 2012 is 26%. Maintenance costs are likely to be tax deductible. Consideration will also need to be given to whether the purchase of the panels would be subject to capital allowances. VAT may also be recovered on the purchase of solar panels. If you would like further advice on whether solar panels are an appropriate investment for your business please contact the office on 01633 871122.